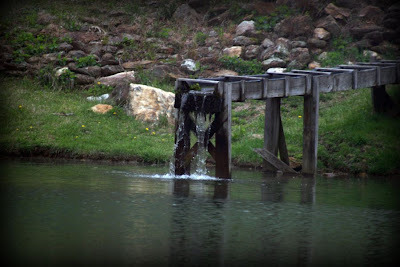 I've been working on an article entitled North Carolina's Best Trout Waters for several days. In the article, you'll be introduced in detail to our state's best trout waters, recommended patterns, tips, tricks, best access, guides and shops, photos and much more. Because it's a lengthy article, it will be converted to PDF format instead of being posted here on the blog. If you don't have Adobe Reader, I'll post info on how to download it when the article is ready to go. I'm hoping to have it finished by Sunday, but, it could be next week. Look for it here on THFF in the coming days. Roughly 500 channels and the only thing that managed to quirk my interest is a fishing infomercial for the Banjo Minnow. While not fly fishing, I reminisced back to a few fishing commercials I've seen in the past. Below is one of them. You can't help but shake your head and laugh. This is the equivalent of an ad informing fly fisherpeople of the new and improved Dave's Hopper, complete with an electronic beacon that serves as an indicator and an embedded microchip in order for the angler to track their fly's every movement via GPS. The sun finally revealed itself up on the Parkway. I took full advantage. 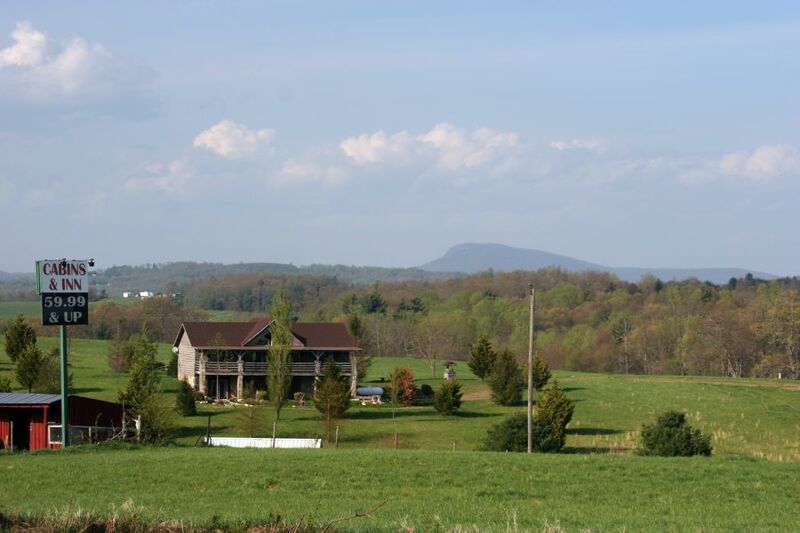 The afternoon began on a small stream near Meadows of Dan, Virginia. Right on the Parkway. Last year, I didn't see nor catch anything. 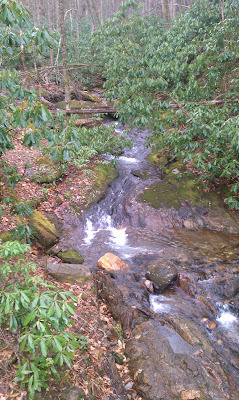 Out of curiosity I hiked down from the Parkway to the stream. Within about 10 minutes I figured out that this stream hasn't changed; still troutless. It was a very enjoyable afternoon though. The weather can't get any better. Sunny skies, upper 70s, a south (thus warm) breeze. No fish in that stream. Plan B: Fish for sunfish and bass at the warmwater pond I fished yesterday. Excellent choice in the end. Many fish caught and as always, another close shave with Mr. Whiskers, who decided to pursue my Zonker only to back off upon closer inspection. Here's a few pictures. the first 5 were shot with the Canon EOS 20D. Because the lens are 75-300mm, It's hard to take fish pictures closer than 5 feet. I'm now concentrating on widening my lens selection. The fish pictures are taken with a Sony Cybershot (point and shoot). 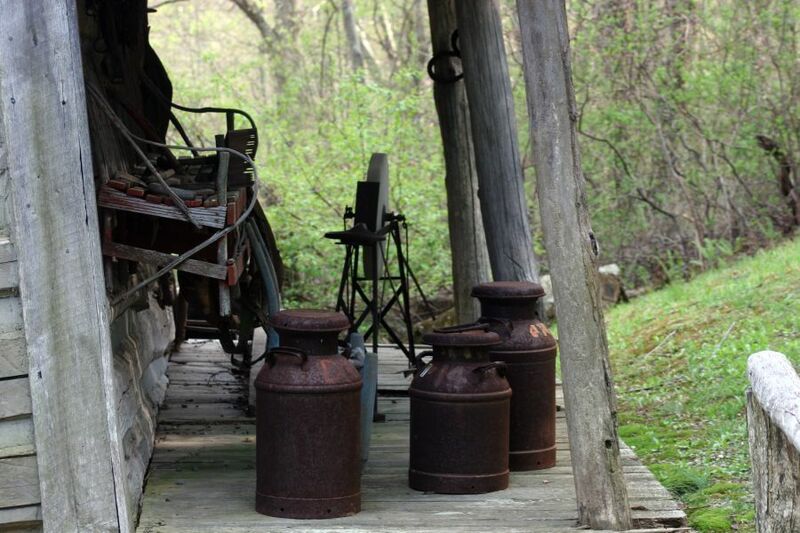 Old cabin and milk jugs adjacent to the pond. ﻿Hope everyone has had a blessed Easter! Dreary. Cool. Foggy. Gray. All describe what the weather was like yesterday and, up here in the southern mountains of Virginia, the first part of today. The sun exploded late this morning, flooding the valley with much anticipated warmth and light. Okay, enough of the ooey gooey writing. 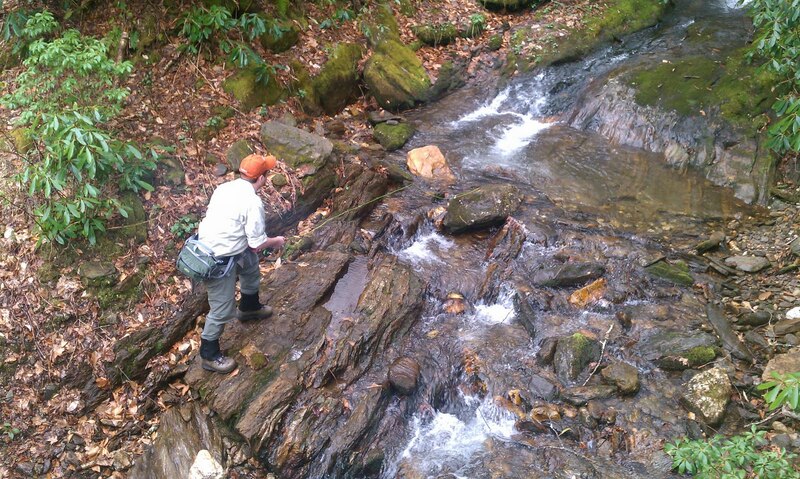 At an elevation of nearly 3,000 ft, you would be more likely to find this addicted wild trout bum stalking brookies. Not this time! The warmwater (in this case coolwater) fishing was calling me. I had some unfinished business with a few fish from last summer. The fog was thick on the Parkway, so I was preparing to fish in it. Fog isn't necessarily an enemy to the angler. The thicker the fog, the harder it is for the fish to detect you. I noticed this today. At times the fog would clear considerably, but most of the time it was relentless. Because of the fog, and the fact that the water was still pretty chilly, the fish were relaxed. Once I threw a #14 foam beetle their way, they immediately transitioned from lethargic to "I haven't eaten in 5 months." You'd mistaken them for piranhas if you didn't know that they were sunfish. As I continued to drain the pond of it's booty, catch a few fish, the fog continued to roll in, swirled by the wind as it floated by. I finished the day with 20 or so fish. Many more LDR's (Long Distance Release) and plenty of misses. One of the most exhilarating moments of today was a close shave with a huge blue catfish while fishing a 6wt equipped with 2x tippet. As I was standing on the bank, waiting for a fish to cruise by, I got more than I bargained for. Out of the depths I saw a dark shadow slowly making its way towards me. My Clouser's Foxee Red Minnow was on the bottom. As I slowly picked it up, the big cat spotted it and approached it, obviously amused. My fly disappeared, and in a split second, reappeared. He ate it before spitting it out instantly. I guess it smelled to fresh for his liking. Maybe I need to roll the fly in roadkill before offering it to him again. He's tried to tango with me several times in the past, but Mr. Whiskers has won so far. 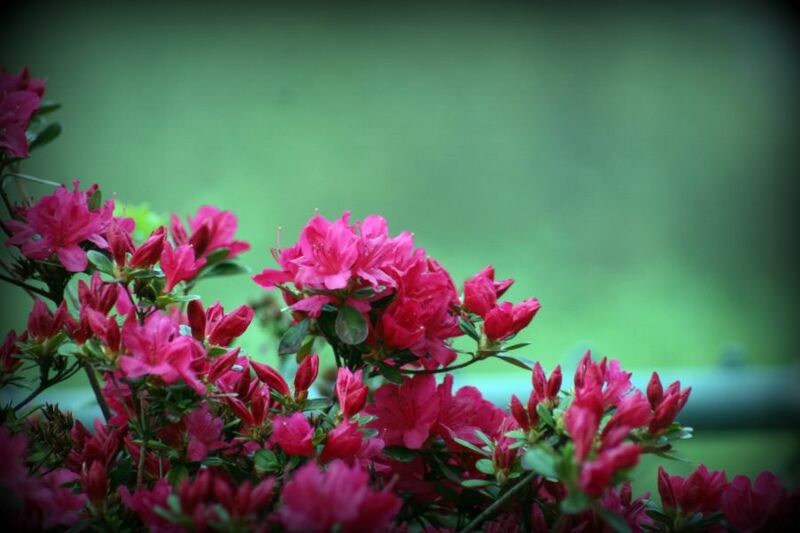 First decent photo with my new Canon EOS 20D w/ EF 75-300mm lens. Large bass giving me the cold shoulder. He's the fish I caught last year. Not many of them of this size in here, so you recognize them easily. Thank the fog for the blurry photo. 1) 80's and abundant sunshine yesterday in some places, 50's and rain tomorrow. It's only temporary though, as we'll shoot back into the 70's and 80's just in time for a great weekend of fishing. From Murphy to Manteo, it's going to be one heck of a weekend. Tomorrow will be a good day to tie some flies, check the gear, clean line, patch waders, and the such. It doesn't look like tomorrow will be a total washout, with rainfall totals forecasted to be in the 1/4"-1/2" range. The rivers will rise, but, unless the rainfall totals are significantly higher, we won't have to worry about major flooding such as we saw last weekend. By Saturday, unless the forecast takes a 360 for the worst, we'll see low to mid 70s in the northern NC mountains (Boone, West Jefferson, Sparta). Upper 70's to around 80 for places such as Asheville, Brevard, Bryson City, and Robbinsville. SW NC, including the towns of Murphy, Andrews, and Franklin, shouldn't have any trouble reaching the low 80s Saturday. So, when it's in the 50s tomorrow, remember warmth is returning! 2) Right now, we're seeing plenty of bugs hatching across the western Carolinas. Dark Hendrickons, a host of caddis, stoneflies, and March Browns. Light Cahills will be hatching pretty soon, so if you're running low, it's time to fill that fly box! From here on out, we'll see increasing amounts of bugs. 3) Terrestrials? Late April? Say what? You heard right. Small black ants in sizes of 14-22 are working. In addition, I would throw some inchworms. Sure it might be a bit too early in some places, but, the fish know what they are. Tucker Horne, who is a member of the NC Fly Fishing Team, told me he had an epic day in the Smokies on inchworms. Nick Johnson, who is also a member of the NCFFT, said he's seen more inchworms this year. Could it be the weather? Could it just be an odd year in which they've decided to emerge in great numbers? Who knows. All I know is that the fish will have a buffet on their hands fins. 4) Another fly fishing legend has passed on. Bill Pate, regarded as one of the world's foremost big-game fly fisherman, passed away on Monday. Read the IGFA article here. The high and swift Broad River. Picture from WBTV. More news stories about folks who are swept away by raging rivers are flooding the local media (no pun intended). 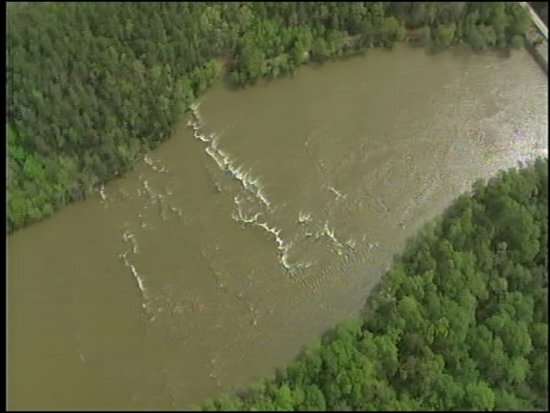 A 14 year old boy was kayaking with a friend, when the Broad River, just south of Boiling Springs, swept him under. Evidently they were trying to cross the river Rescue crews searched relentlessly yesterday until dark forced them to try again early this morning. Today, rescuers continue to search for him. Dive teams are utilizing sonar equipment in an effort to locate the young victim. Of course murky water is making the search arduous. Read the full article here. Approaching swift water is like creeping up on a sleeping bear. It looks like you can get close to it without a problem, but as you near it, problems are likely going to arise. You have to respect swift water (and sleeping bears). It has a mind of it's own. Once you make the decision to enter that raging river, it'll often have you in a head lock quickly. Please don't become a news story! One of the worst tornado outbreaks in NC history, very high water, tons of swift water rescues, and baseball size hail. All in about 2 weeks. You win Mother Nature. Now GIT! Mike over at Troutrageous! shared one hilarious video with his blog readers. I had to share it. If your fishing guide carries an air horn with him/her on guided trips, you better wake up before they do! Check it out below if you're looking for a good laugh.. I'll start with the bad news and then end the post with the good news. Typing this still sends chills down my spine. If you've been watching the news this afternoon, whether it be your local NC news channel or the Weather Channel, you probably know all too well about the tornadoes. Skywarn spotter report from Dunn, NC, Dragstrip Road at NC 242: "I'm sitting in my front yard and my house is gone, my neighbors' houses are gone, they don't even have any debris, most of my roof is across the street." Apparently 3 fatalities and 2 dozen severe injuries have unfortunately been reported in the Raleigh area. In addition, one person was killed in Cumberland County, three people were killed in Bladen County, and another in Dunn in Johnston County. you can read the article here. You can find submitted photos of the storms and the aftermath on WRAL. Authorities expect more casualties. Let's hope they're wrong. If you're still dumbfounded, you're not alone. I am too. It's always a sickening feeling when a tornado is projected to sweep through a heavily populated area. Watching a tornado meandering through desolate countryside is a thing to see. It's not all fun and games when that twister finds its way into a populated town or city. It's downright scary and dangerous. It really hits home when it happens in your state. Neighbors in Eastern NC, you're in our thoughts and prayers. Stay safe my friends. Hang in there. Finally, the good news. All nine campers and hikers that were swept into Wilson Creek after flood waters rapidly rose, have been rescued. Aside from a minor arm injury, all are okay. Read the article here. Arguably the best DH river in NC, Wilson Creek, took the life of a fellow angler from Virginia right around this time last year. Sadly, we could be on the verge of more fatalities as a result of the excessive rain we've experienced. I'm staying abreast on the latest info. When new information comes in, look for it here on THFF, Twitter, and Facebook. I really hope the next update will inform everyone that these folks were found alive and well. Cross your fingers and toes. Article below from the Hickory Daily Record. BROWN MOUNTAIN BEACH -- Rescue efforts are underway to save campers after rising waters swept away several camping trailers at Killian’s Campground near the Wilson’s Creek Visitors Center in Caldwell County. Two of the camping trailers washed away have victims inside and they are stuck in the water. Crews have reached the trailers by boat but are waiting on equipment to rescue the victims from the campers. Rescue personnel from multiple agencies from Charlotte and across Caldwell County have gathered at Brown Mountain Beach Road. It is not known exactly how many campers were swept away. The only confirmed injury so far is a broken arm but rescue crews have not reached any victims yet. Rescue Crews have seen some victims on land on the other side of the creek but are having to hike an hour to an hour and a half to reach them. The agencies involved are Caldwell County EMS and EM, Collettsville, Sawmills, North Catawba, Hudson and Lenoir Fire from Caldwell County and Oak Hill Rescue from Burke County. Inchworms... From the fish's perspective, it's what's for dinner. 1) Evidently I'm an inchworm magnet. After mowing the yard, I discovered inchworms on my arms, legs, hat, and clothes. They're swinging on their silk lines from every tree branch it seems. I honestly don't think we've seen this many before (maybe I just haven't been paying attention over the past few years). The bottom line is, if you're a warmwater angler, whether you're fishing the Uwharrie for smallies and sunnies, or Lake Norman, have some inchworms in your box. Tie an inchworm dry on, cast it under some overhanging trees close to the bank, and start counting fish. You'll lose count quickly. If you're more of a coldwater angler, you've got some time, but not that long. We'll start really seeing the little green worms popping next month in the mountains. 2) Although weather isn't relevant to fishing, it effects fishing immensely. Overnight and into tomorrow is a prime example. We're on track for what will likely be one heck of a bumpy ride in some parts of the state. Just ask the folks down in Mississippi and Alabama today. While the cold front won't be as robust as it has been back to our west, it will still produce some nasty storms out ahead of the front. Fishing will not only be lousy for the first part of tomorrow, but it will be downright dangerous. This is what you get when you wave a highly conductive 9ft fly rod in the air during a storm! Looking for a high quality small stream fly rod that won't break the bank? Look no further than the Cabela's TQR. It's designed with the small stream enthusiast in mind. From its lightweight build to its highly attractive appearance, the TQR is just what you've been searching for in an affordable long rod (well, short rod in these cases). The acronym TQR appropriately stands for Tight Quarters Rod. Here in the Appalachians, small streams are like bologna sandwiches; they are narrow streams (the thin slice of bologna), crammed between two thick walls of rhododendron (the bread). In order to fish that "bologna" successfully, you need a rod that is small and lightweight, yet reliable and dependable. You also need a rod that will put some cash back in your pocket for the gas needed to get to some of these remote backcountry streams. Holding the TQR, you'll first notice how lightweight it is. You can thank Cabela's for this. The use of cork to construct the reel seat cut the weight down substantially. Of course the fact that this is a smaller rod, available up to a 5wt, contributes to its lighter-than-average weight. I was standing in a medium sized river with my recently purchased TQR in my right hand. Before me, a deep, long, pool awaited. This was my chance to test the TQR's "backbone." I slowly got into position and made the cast. 30 feet of line slid through the guides and shot to the target with ease. You won't be making any 80 foot casts with this rod, but it sure can deliver your fly a considerable distance for its size. All in all, the TQR is one fantastic rod. If you're looking for a rod that offers affordability, excellent performance, and is pleasing the eye, the Cabela's TQR is the one. Congress came to an agreement just before midnight, preventing a government shutdown. We were all gearing up for a potential shutdown of the National Park Service, thus Great Smoky Mountains Natl Park closing all facilities, roads (except US 441) and services within the Park. I am pleased to say, this will NOT be the case. GSMNP is open for business. Hallelujah! Congress will work all week to further cut spending. So, to celebrate, I went fishing. On the NPS operated Blue Ridge Parkway. It has been a long while since I've had a day so epic, so eventful, and from 1pm to 7pm, so nerve-racking. At 7am, the harsh HONK HONK HONKing of the alarm clock awoke me. Today, it was a welcome sound. It signaled a day of unwinding and relaxation. With the truck loaded, I was west bound once again. This time to the streams I have abandoned since last September. The forecast changed a bit as we approached the weekend. 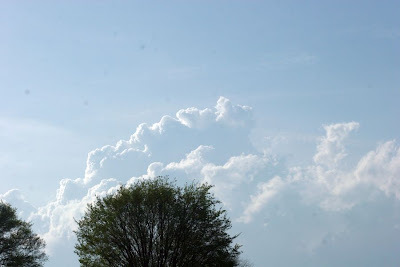 The meteorologists began increasing the t'storm chances. Not your typical evening storms that you expect almost every summer evening, but powerful supercell thunderstorms unleashing 70mph winds, softball size hail in some places (baseball size hail in many locales), and tornadoes. Fishing today was a dicey proposition, but all went well. I was going to enjoy what little nice weather there was in the late morning. A lot of the other folks hiking and fishing would have agreed. With severe t'storms in the forecast, I had to resort to more accessible streams. 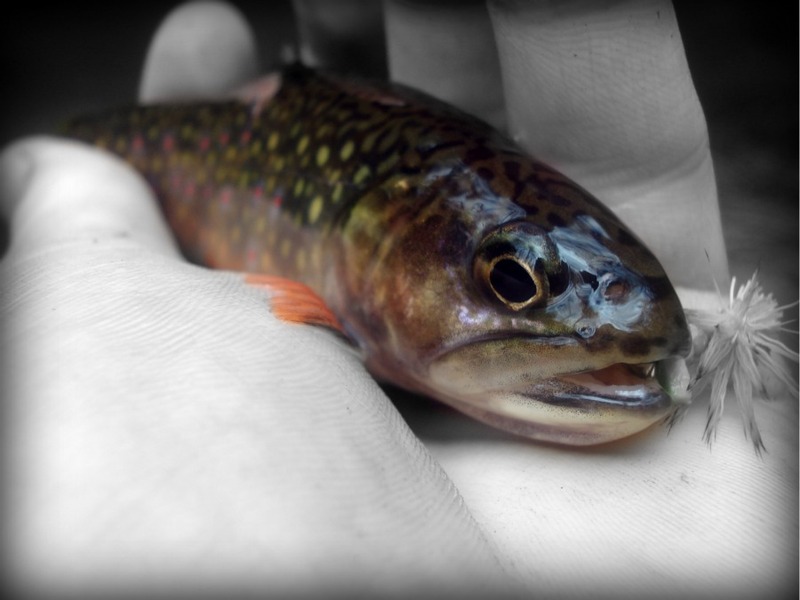 I still was determined to stalk some specks, so I chose one of the few somewhat easily accessed wild brookie streams. The specks are really starting to wake up after a long, cold, and snowy winter. They were still a little lazy and lethargic despite the water being surprisingly comfortable. One of the first casts, enticed a dark torpedo shaped figure to the surface, followed by splashing and in moments, the first speck of 2011. He lazily and slowly rose to the surface to meet my dry before lightly plucking it from the surface. 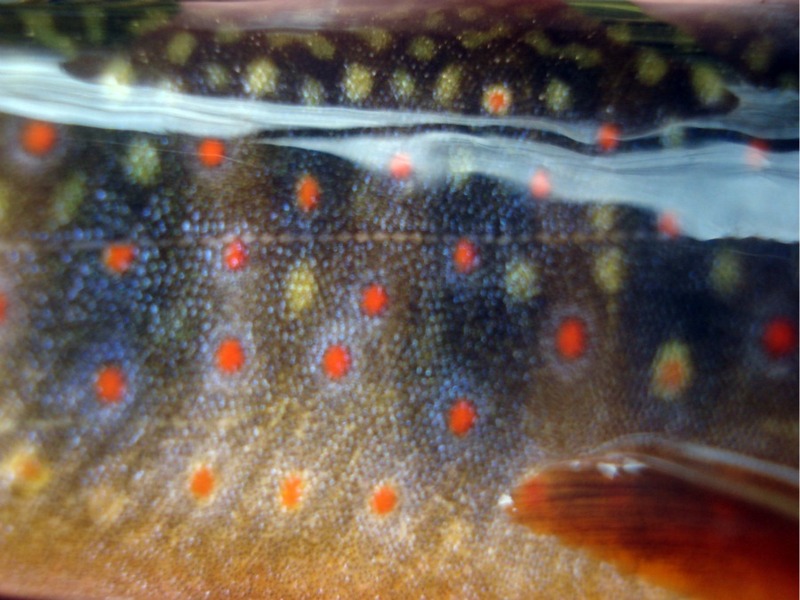 I've never seen a trout (well, char in this case) eat a fly, artificial or the real thing, in the manner this guy did. Not a ring, tiny wake, large bubbles, or a sound when he took it. By 1 this afternoon, the distant, yet ominous sounds of thunder echoed through the ancient mountains. I high tailed it to the truck and waited for the relatively fast moving storm to move on. The sun came back out and I went back to fishing. 30 minutes later I was forced to head back to the truck once again. The sunshine was quickly becoming engulfed by storm clouds billowing over the the mountain peaks surrounding me. Heavy rain and dangerous cloud to ground lightning was moving back in. I repeated this process many times. Towards the end of the day, one particularly nasty storm rolled in, dropping large hail. I was lucky to have bolted to the truck as quick as I did. Just as I jumped in, Mother Nature let some rage out. Quarter size hail (eventually mixing with golf ball size) started falling from the sky at velocities upwards of 100 mph. No damage. If the hail would have been any larger, there would have been! Without further ado, here's the rest of the pictures of the trip. Didn't take a picture of each fish, but snapped some of selected fish instead. Convergence of 2 streams. This is the exact point where a certain popular WNC trout river is born. The reason why bluelining would have been a disaster. The hail actually melted a bit by the time I took this picture. HAIL no I wasn't hiking into the backcountry today! Finally had the opportunity to see the 2wt bend! Excellent rod the Cabelas TQR is. Well priced and just as good as a $600 rod. Looking forward to fishing it again! I've got a feeling most of the trips this spring, summer, and fall will be on streams such as this. Personally, I'm not a big fish junkie. Between 25" browns on the Davidson and 7" specks on a stream you could leap across, I'd pick the latter. I might frame the picture above and hang it on the wall above the tying desk. Picture perfect weather despite a few t'storms. Asheville's highs should be in the mid to upper 60s this time of the year. 82, the forecasted high for Sunday, is the norm in late June! There could be a catch though. A backdoor cold front (front moving in from the north/northeast as opposed to the normal west and northwest direction) could make Saturday's high temps a mess. If the front moves in soon enough, we could be seeing much cooler temps in the 50s and 60s. If the front stays north of us, Saturday will be nice with highs in the mid 80s in the Piedmont and upper 70s to possibly some low 80s in the mountain valleys. The front lifts back to the north Saturday night/Sunday paving the way for what could be the best day of the weekend, Sunday. Snow, especially accumulating snow, is looking highly unlikely from here on out. October will probably be the next time we see measurable snow. Warm will be the word for the next several days. Not quite wet wading weather just yet, but we are well on our way. Chilly low temperatures are keeping the water pretty chilly. It might be a bit too chilly for us anglers, but the trout are loving it. Once summer rolls around, things reciprocate. Rivers are warmer and allow for wet wading, but the fish are gasping for dissolved oxygen and cooler water. We're in early April, so none of that just yet, as water temps are in the mid 40s through the 50s across WNC (cooler up high, slightly warmer lower). They'll continue to warm, but it won't be enough to trade the waders for the wet wading gear. The hatches are starting to get more interesting. Quill Gordons are still hatching, but are now mixed with Hendricksons and a few March Browns. Black Caddis are still present as well. Light Cahills, the cream colored mayflies that are so common in the summer, should be hatching by late this month. By May, terrestrials will be on the increase. In fact, I ran into a lone inchworm dangling from his silk line early this morning. When you see inchworms, you should start thinking about filling the rest of your terrestrial box! Once the grasshoppers are out, the game is afoot. Nymphs in the morning and dries in the afternoon is the rule to follow. Pheasant Tail Nymphs, Prince Nymphs, Lightning Bugs, Copper Johns, Zebra Midges, Hise's Hetero-Genius, Rainbow Warriors, and the list goes on and on. A Green Weenie will also catch fish, albeit it imitates summertime inchworms, the fish seem to be mesmerized by it. I've caught fish on cold winter days on Green Weenies. Check out the updated recommended flies list under "Fly Fishing WNC" in the menu bar for more suggestions. As far as dries go, make sure you have some #12-16 Parachute Adams (Standard works well too), a few #12-14 Quill Gordons and a Dark Hendrickson or two. Most rivers and streams here in the Old North State are fishing well. DH waters are fishing exceptionally well, as they usually do in the spring. A fellow angler over on the forum said he and a friend (who is visiting from Louisiana) had an incredible day on Wilson Creek. He mentioned he easily caught 30 fish. One of which was a nice 20"+ rainbow! Get out and fish this weekend! Slowly learning and absorbing information on the potential "closing" of Great Smoky Mountains Nat'l Park (along with possibly many other Parks). When I say closed I mean facilities, restrooms, campgrounds, services, and the such. The reason behind the possible closure is the fact that the US government may shut down Friday. Republicans and Democrats of course don't see eye to eye and are trying to work up an agreement. If they can't, they'll turn the proverbial water cannon of spending off. Parks, including GSMNP would be affected by this battle between the parties. From the information I can muster up, we will still be able to access the Park, but most amenities will be nonexistent. In November of 1995, the Park closed all facilities, campgrounds, and halted all services within the Park. We could be looking at a repeat. Check out the article here. So, if you are planning on camping in the Park, keep a close eye on things. Don't want anyone to drive all the way to the Smokies to find that the campgrounds have closed. I'm not into politics. You can probably tell. I leave it to the politicians. If I'm missing something or have something backwards, feel free to chime in. Still slowly gaining more knowledge on this issue. It was a rough one last night. The cold front that moved through left its mark. Massive oak trees that have withstood decades were snapped like a twig as wind gusts in excess of 90 mph (Strong Cat 1 hurricane strength) roared across the Carolinas. 100 mph winds were also possible. I have been living in the great state of North Carolina for all of my life. I can honestly say this was the worst damage we've seen in quite some time. Could be the worst since Hurricane Hugo. Check out the storm reports here and some eyewitness pictures of the damage here. Hope everyone is okay. 7 folks lost their life in these storms here in the south. Imagine being out in the backcountry miles away from the nearest run down shack when these storms rolled through. No 90 mph winds today. In fact the weather just keeps getting better. The cold front cooled us all down, but starting tomorrow we gradually warm back up. The zenith of the coming warm spell looks to be this weekend. Just in time for a weekend of some fantastic fishing. This weekend will be nothing short of spectacular. Sunny skies, very warm temperatures, yet cool water that is running at normal levels, will combine to make for some great fishing. Get out there if you can! DH waters, C&R waters, wild streams, tailwaters, and everything in between should be fishing well. Check the "Recommended Flies" in the menu bar above. 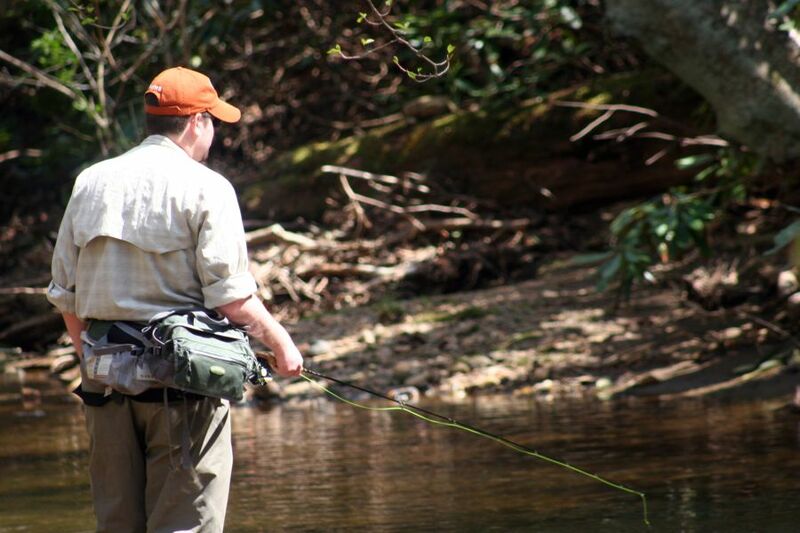 Hover your mouse over Fly Fishing WNC until you see "Recommended Flies." I have been blogging for 3 years now. It comes with its advantages and well, very few advantages, other than it being addictive. I have enjoyed interacting and in some cases, meeting some of the readers. It's one of the hardest things I've had the displeasure of saying, but on April 25th, THFF.com will be shut down. The forum will still be up and running and I'll be lurking every now and then. A fully operational blog is becoming harder and harder to maintain, as I'll be off to school here in a few months. It's a choice I've been contemplating for the past month or so. Finally decided to pull the trigger. So, with that being said, here's a makeshift blog I'll use when THFF.com is no longer operational. As of now, I won't be updating the new blog as frequently as I have here. Just a place where I can update every now and then. Sincerely appreciate the support and the camaraderie over the past 3 years. Happy April Fools Day my friends! Just a joke. THFF is NOT closing its doors. I'll still be writing gibberish here on the blog.